Salomon is well known for cutting-edge trail runners, but can they make a Mid? Yes—and it's a good one. The X Ultra Mid GTX is rugged, stable, and very light. I admit I absolutely obsess over hiking shoes—and in particular, the mid category. Many of us prefer hiking in the lightest shoe possible, but still need the support of a heavier shoe for bearing overnight loads, scrambling over talus, or crunching vertical—or all of the above. The modern mid, at its best, hits the sweet spot between trail runner and hiking boot. And that's exactly what Salomon has given us. The X Ultra Mid GTX weighs a remarkably light two pounds even (men's 9.5, pair, measured). Sixteen ounces per shoe puts the Ultra in elite company when it comes to hiking boots, exactly matching that long-lost lightweight masterpiece, Nike's Air Zoom Tallac, as well as La Sportiva's current light-is-right concept hiker, the Xplorer Mid. The standout quality of the X Ultra is its fit and support. This doesn't feel like a bare-bones, stripped-down shoe—it has a pleasing sense of structure and comfort. 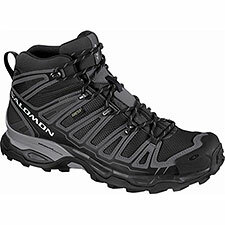 Salomon gives us a generous toe box, making for a roomy feel overall. Combine this with the shoe's solid level of support, and we get a light mid that proves well-capable of handling ultra-class adventures. There are few details worth quibbling about. The shoe's heel angles aggressively outward, creating a scoop that flips up dirt, sand, and pebbles—right into the cuff of the shoe, which doesn't seal tightly. On especially loose ground, this all but necessitates combining the X Ultra with scree gaiters. Out-of-the-box, I found the cuff a little grabby at the heel (hopefully this will soften as the boots wear). I do wish the X Ultra were available in a non-GTX version, for better breathability in hotter climates. Without the GoreTex layer (and the sole's sand-catching effect), this would be an excellent Grand Canyon shoe. Aside from these issues, I'm inclined to describe the X Ultra as a perfectly realized mid. Just as the concept promises, it weds light weight with solid support. Recommended.